Lindsay recently finished recording the audiobook for “Dexter’s Final Cut” at the Gilley Recording Studio in Appalachian State University’s Hayes School of Music. 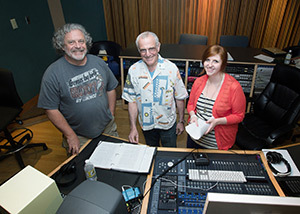 Jeff Lindsay, left, author of the Dexter crime novel series, has narrated two of his novels for Random House audiobooks at the Gilley Recording Studio in Appalachian State University’s Hayes School of Music. Also pictured are producer David Rapkin and recording engineer Iris McElroy, a 2010 graduate of Appalachian’s music industry studies program. It’s the second audiobook he has recorded at the studio, and the seventh in the Dexter series. It will be released by Random House in September. Lindsay often vacations in the High Country. When he learned about Appalachian’s recording studio from Random House, at first he was skeptical. “Then, I came down, opened the door and peaked in and saw that this was a really good studio,” Lindsay said. He also met Iris McElroy, a 2010 graduate of Appalachian’s music industry studies program. She has served as the lead recording engineer for Lindsay’s past two audiobook projects. “After about 30 minutes it became quite clear that she knew more about recording than I did, so I do what she tells me,” he said. “It just seemed like a natural to me,” the former actor said of his decision to narrate his books. Lindsay also has done voice over work in the past. “I can do this,” he told his publisher. “I have done other audiobooks and I’m good at the voice stuff, so give me a shot.” And they did, but who’s really going to tell a writer whose main character is a serial killer “no”? Lindsay works with David Rapkin, a New York-based freelance narration director and producer who works with Random House. They have been partners in recording the crime novels for two years. As a result of the first recording project in summer 2010, Rapkin helped McElroy gain a full-time position with John Marshall Media, a multimedia production company in New York City. Rapkin, who has been producing and directing audiobooks since 1985, said a 15-hour audiobook takes about five days to record, including any necessary retakes. He agreed the most difficult thing about narrating is the degree of focus and concentration that is required. Rapkin also narrates audiobooks for Audible Inc. He says his role as director and producer is to help narrators with the transition between the written and spoken word. “The two media are different and the transition is a delicate one,” he said. Since he wrote the material, Lindsay said he doesn’t need to mark pauses, inflections or other direction when he narrates his book. “Those are things that I have written in (the book) and I know those,” he said. Lindsay writes about one book a year, following a work schedule that few would choose. “When I write, I get up at 3 in the morning. That’s the time that works best for me,” he said. After a couple of hours he takes a break to get his children ready for school. Then he resumes writing after lunch. His goal is to complete five pages a day.